When my son was potty training he HAD to have “foamy” soap. And I was so desperate to get him potty trained that I was willing to give him anything. It wasn’t long before I figured out that foaming hand soap is expensive, runs out quickly and produces a lot of waste with all those bottles and pumps. Not to mention the undesirable ingredients. So I decided to make my own refills. Did you know that the foaming action is just dependent on the special pump? And did you know that foaming soap is mostly water? That means that making foaming soap refills is really, really easy. You actually only need two ingredients: soap and water. 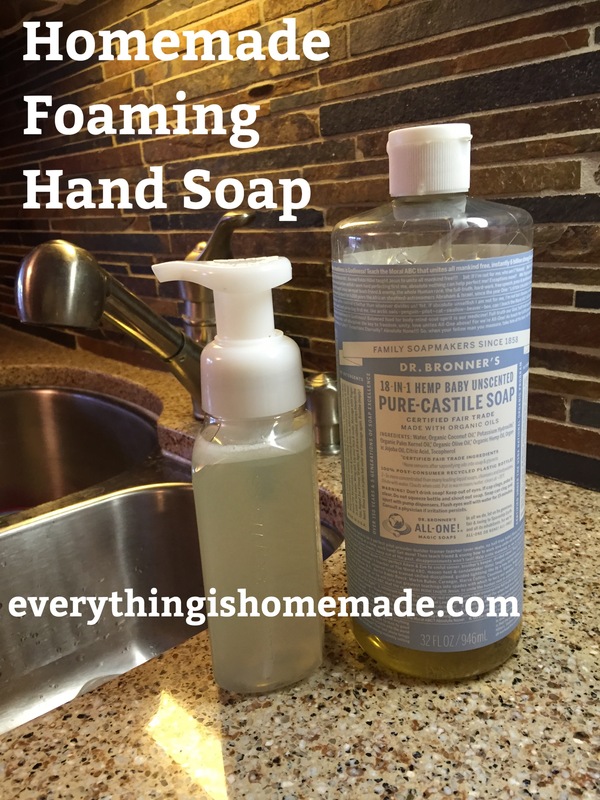 I use unscented castile soap most of the time but you can use any liquid soap. I’ve grabbed the dish soap and used that in a pinch! Here are the instructions for a basic refill. Add soap to bottle. Top with water. Give it a few gentle shakes and you’re ready to go! After making the first refill you won’t even need to measure the soap anymore. Just eyeball it. Now if you want to get fancy and have a bit more time, you can add a few extra ingredients for more moisturization and a nice scent. I like to use honey and/or almond oil. In a glass measuring cup with a spout, measure liquid soap. Add honey, almond oil and essential oil and stir gently to combine completely. Pour soap mixture into foaming soap bottle. Top with water. Give it a few gentle shakes to combine and you’re ready to go! Honey and almond oil can be used together or separately. Almond oil could be interchanged with other types of oils such as jojoba or apricot kernal oil. Essential oils can be included or excluded depending on your preference. Lemon or sweet orange is nice in the kitchen and lavender works well in the bathroom. You could also use tea tree for its antibacterial properties. Note: If you have small children and would like to use essential oils, please do some advance research. Not all essential oils are safe for children. This article seems to be a good reference and I’m sure there are plenty other resources out there. Finally, where do you get the foaming soap bottles? Well I’ve been refilling my Bath & Body Works bottles for over a year now and they are working great. You could buy any foaming soap at the store and then refill it once it runs out. Or if you’d like to start fresh, Amazon has several options for empty foaming soap bottles such as this 4-pack . Making your own soap refills only takes a bit of time and will definitely save you money in the long run. Not to mention less chemicals. I don’t have time to do everything homemade that I would like to but this is one simple thing I can do. **This post contains Amazon affiliate links. If you purchase a product through an affiliate link, your cost will be the same but I will receive a small commission. My wife has been making our own soap this way for a few months now. It works really well and is a good way to reduce your chemical usage. Thanks for posting the info for other people to see.